Easy Rack combines workmanship and affordability in its line of indoor and outdoor commercial warehouse lighting products that offer a variety of commercial lighting fixtures & lamps that provide major energy savings and lowered maintenance costs due to longer lamp life. Industrial warehouse managers are continuously searching for new ways to economically light their surroundings, and commercial warehouse lights are leading the way in the commercial and industrial business sector. This ground-breaking development in the lighting industry is gaining high standing among commercial business owners. Commercial HID lighting fixtures, better known as high intensity discharge, offers many benefits. Easy Rack provides a wide selection of commercial warehouse lighting fixtures that include metal halide fixtures, HPS (High Pressure Sodium Lights) floodlights, low bay lights, high bay fixtures, wall-pack lighting fixtures, work lights, bollard lights, and security lighting fixtures. Commercial warehouse lighting offers some of the most intense illumination to the naked eye. Take for example a 35 watt HID (High-intensity discharge lamp), and put side by side to the standard incandescent bulb. The High-intensity discharge lamp fixture can produce up to 6 times the amount of light as its incandescent predecessor. Many commercial high-intensity discharge lamp devices are equal to that produced by sunlight. Although not natural in its purest form, the white light produced from these commercial light fixtures can improve overall side-line vision, as well as, improve visibility. In aviation, a commercial HID lighting fixture plays a significant role in bad weather situations. The combination of a more natural light and the snow white coloring of high-intensity discharge light results in greater lumens output, which allows planes to land and takeoff in safety. How does a commercial high-intensity discharge lamp work? In simple terms, running a current through a metal vapor can scatter illumination. These devices basically take a standard light bulb and replace the existing filament with a gas capsule. Light is then dispelled from an arc with adjoining electrons which are enclosed in a tiny quartz glass part that is shaped like a tube. In order for these commercial lighting fixtures to operate well, ballasts are required. Ballasts provide the right amount of voltage to the light fixture, while controlling the current at the same time. Most of these lighting fixtures have a delay time of about 15-20 seconds before reaching full power. 3. 3-5 times longer life than incandescent bulbs. 4. Can save up to 30% on energy bills. Tips For Using Commercial Warehouse Lighting Products. Safety measures should be followed, in order to determine the highest quality from your lamp. Keep the quartz glass clean, to allow for proper lighting to be dispersed. 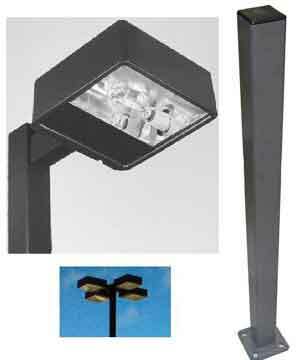 Commercial lighting fixtures produce UV rays so extended exposure to this light source should be avoided. Do not stare at your lighting fixtures for any length of time since ultra-violet radiation can be harmful to the eyes. Never handle the light bulb, if it is operating, and always allow the bulb to cool off before changing it. Warehouse managers should check for signs of a failing bulb which include reduced light output, arbitrary start times, and dark spots at the tip of the arc tube. Agriculture Barn & Horse Arena Light Fixtures.